A couple of things have piqued my interest about pigs (hogs, swine if you prefer) lately. Two newly discovered facts which I will share below, and a custom order got me eventually modelling ham legs instead of just dreaming about doing this. So, all in all, I have been prompted to post about pigs! 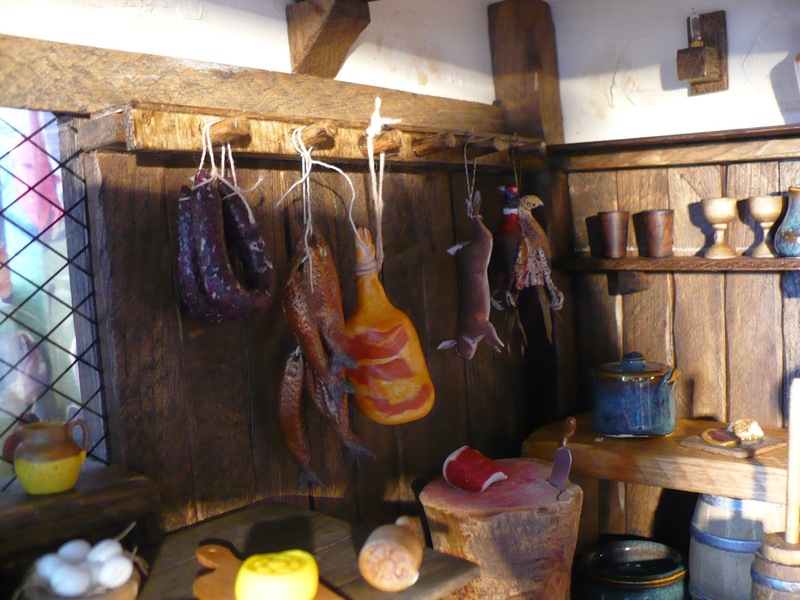 And here is my ham plus some black puddings and red herrings hanging in client Linda's beautiful 1550 Tudor dollshouse setting at her home in Lichfield, a noted medieval city. A short while ago I was idly flicking through the TV channels when I accidentally paused on some channel, but with my laptop engaging my full attention. I was alerted when I heard the narrator exclaim about pigs wearing pokes. My interest was immediately aroused, I have always wondered what a pig in a poke really is. On the screen was old anthropological film footage in black and white, taken in Indonesia I think, and I saw were three cute long legged pigs running about on the edge of some scrub forest. They were wearing something around their necks and this gave them a rather comical air. One of my first clients in San Francisco, brought up in the country but now living in the city, said that she had been taught never to buy a pig in a poke. (We were probably talking about customised orders of dolls house scale model food!) This is a common saying on both sides of the Atlantic. One that we use a lot today in my experience, after all we all like to get good value when parting with hard earned money. 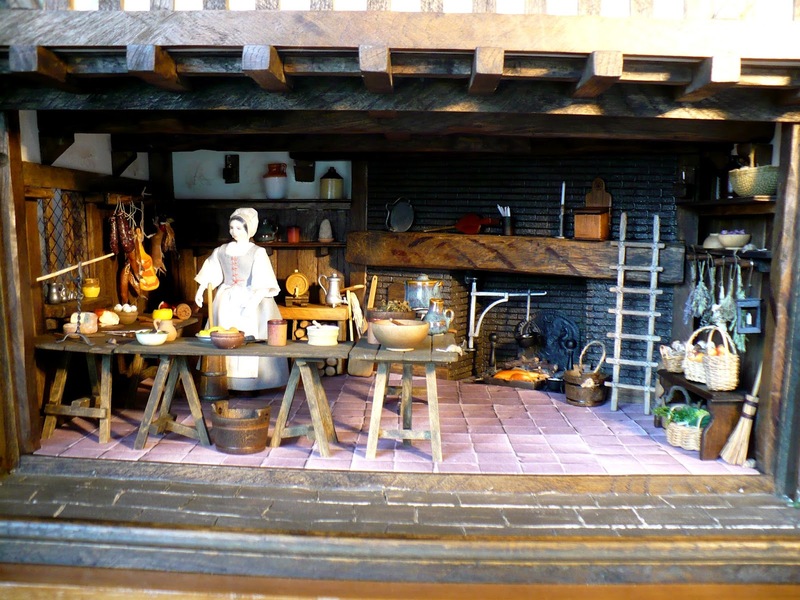 So I promised my client that I would find out about the expression when I modelled new pork, ham and bacon products for MedievalMorsels’ dolls house miniature food range. Well okay, I admit that was quite a long time ago and so far I have only modelled whole hams from the ancient foraging forest pig. In this medieval woodcut pigs are enjoying the fruits of the forest - autumn acorns! The other pig item that caught my attention was a trailer for a BBC radio programme yet to be broadcast about local and regional foods. One programme was/is to be about the Tamworth pig and, presumably, Wiltshire ham. The food expert was saying the Tamworth pig is about the closest domesticated breed we have to the ancient forest pig, so my ears pricked up at this. I am looking forward to hearing that particular porcine programme! Almost 20 years ago in 1998 two Tamworth pigs escaped from an abattoir in Wiltshire, breaking through a fence and swimming across the River Avon to leg it to freedom. The Tamworth Two, as they became known, quickly became more famous than notorious escaped criminals. They were spotted on and off by a now pursuant international press pack, enjoying their freedom and neatly evading their own capture whilst simultaneously capturing the world’s attention. This was the before the days of You Tube phenomena, but you could say they had gone viral! These enterprising and intelligent porcine siblings were photogenic too, with lots of ginger hair and delicate snout, body and limbs. Endearing and intelligent, pigs have it all. So was a poke another type of sack or bag? 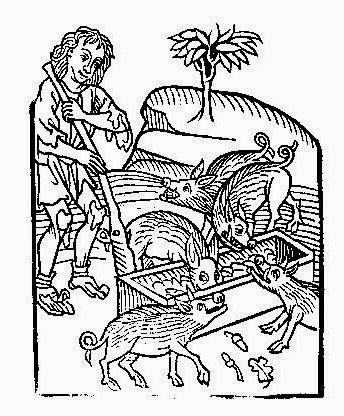 Armed with real anthropological evidence about free range pig rearing practice it seemed as though today’s meaning had got removed from an original piggy use of the word “poke”. This poke was a sort of necklace, if you will, for a female pig and a collar, if you prefer, for a male pig. The poke was made of three long robust sticks tied together around the pig's neck in a widely overlapping triangle. 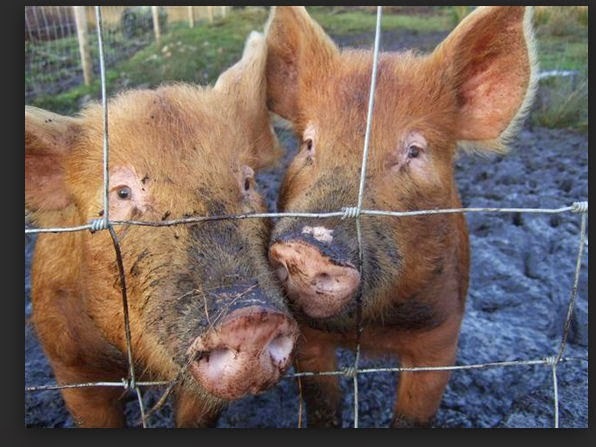 A perfect remedy to prevent your pigs roaming into dense scrub land or away from the forest clearing. And the Tamworth Two? Well their story ended happily. Aged only six months when they escaped Sundance, the Tamworth boar and with his sister Butch (geddit?) enjoyed a week on the run scavenging in the back gardens of locals. I expect they were only too pleased, assuming all the potentially prize-winning vegetables were on the allotment. They were captured, bought and sponsored by a daily newspaper and re-homed in luxury at a Rare Breeds Centre in Kent, where they attracted many visitors. In 2004 the BBC even made a drama about them. They died at the ages of 13 and 14 respectively. 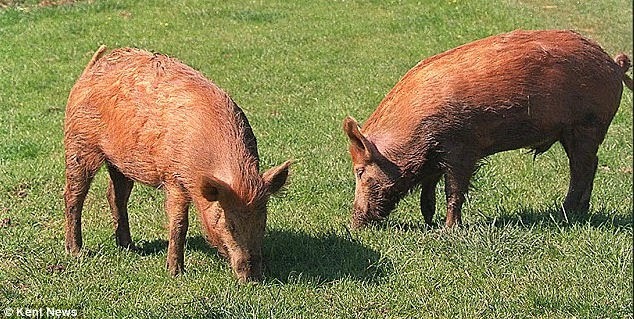 It turns out that these wily pigs were actually Tamworth and wild boar cross-breeds, which may account for their innate ability to outwit their handlers and pursuers chasing them for a full week around Malmesbury in rural Wiltshire. And the thing is if they had been wearing pokes they would not have escaped at all! But...to return to the saying "never buy a pig in a poke". A poke is also a Middle English word for a small sack or bag, and there are similar words in many old northern European languages. So we are back to our first presumed interpretation of the old saying. 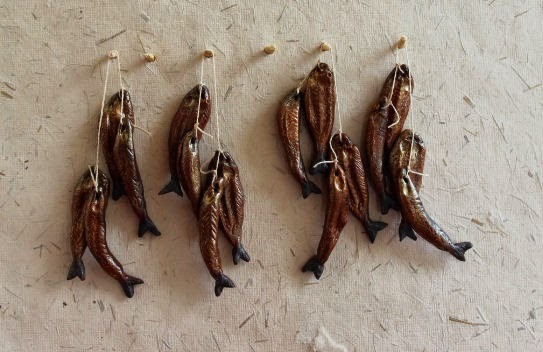 The anthropological interlude with collars was, in reality, a porcine "red herring"! How about the meaning of the word cowpoke anyone? Sure, it a colloquial term for a cowboy. But in times gone by the practice of using a forked branch as a collar poke was a sure way to keep foraging cattle in the enclosure or close to the settlement. MedievalMorsels is now on FaceBook! Please visit and "like" if you can!